Having just awoken from a long winter hibernation a bear scoops a pawful of sweet honeycomb from a wild beehive. Despite the thick cloud of bees swarming about its head, the bear languidly feasts on the delicious honey, as content as can be. At The Honey Paw we aim to deliver the same experience for our guests, minus the bees. Instead of honeycomb we look to steaming broths, savory wontons, and wok-fried noodles to hit that same sweet spot. Join us all day, grab a seat at our bar, or tuck into a bowl of noodles at our large communal table. If you’re on the go, arrange for some take-out-we’ll have it waiting for you. The Honey Paw is owned and operated by Big Tree Hospitality. We are always interested in connecting with potential employees. Ideal candidates will demonstrate a genuine sense of hospitality, eagerness to learn, and a strong work ethic. Bring a resume and cover letter to 78 Middle Street or inquire at info@thehoneypaw.com. Meanwhile, alongside the bars and lounges, many of the award-wining restaurants dotting the city are increasingly giving just as much attention to their craft cocktail programs. There are food-nerd favorites like the Honey Paw, which dovetails its Asian menu with numbers like Dancing by Yourself, a pour of Cocchi Americano, Fernet, fresh-squeezed grapefruit juice, and mint. 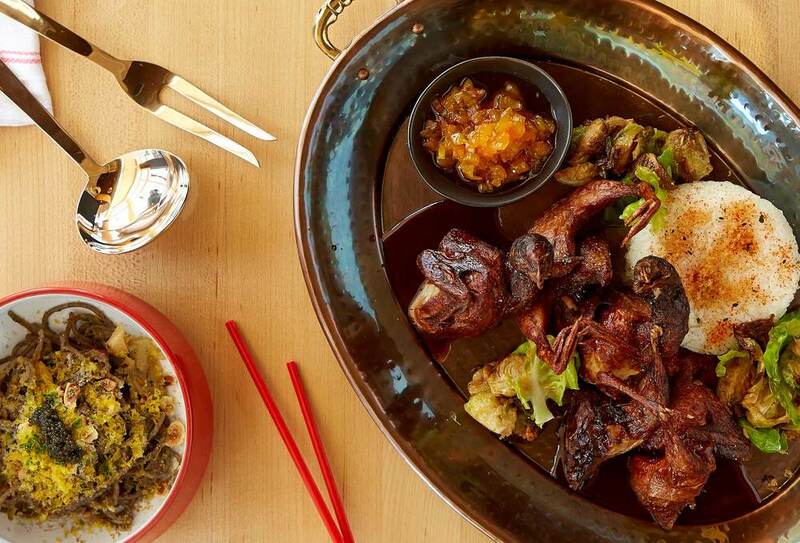 The owners of Eventide created this modern pan-Asian joint next door, where handmade noodles or New England ingredients make it into every dish, whether it’s congee or Korean fried chicken. Restore yourself with smoked lamb khao soi, loaded with crispy egg noodles buried in coconut curry with fermented mustard greens. Grab a quick bite at the Honey Paw, a newly opened downtown spot focused on noodles from around the globe. The menu crosses cultures with ease: Think internationally influenced bowls like ramen with boat-noodle broth, pork, and veal ($16); pork-sausage ravioli with country-ham brodo, asparagus, pickled ramp, and pea tendrils ($14); and dolsot bibimbap—grilled scallops with bonito, mushroom, egg, and kimchi ($29). A chef once told me that restaurants are a lot like relatives. There are those you visit frequently and always enjoy, a few you see only on special occasions, and several you tolerate. If you’re lucky, though, there are one or two you want to know better. Sure, they have a few quirks, but they’re bright, creative, known for their good taste, and filled with such energy that you look forward to your next encounter. Every Sunday night at 4:00 we will be featuring a different cocktail paired with a special bowl of ramen.